For Jews of the world, Passover starts this evening. Depending on one’s level of observance, Passover preparation can range from merely strenuous to downright exhausting. The pious scrub their kitchens to a fare-thee-well, and then cover all the immaculate surfaces with aluminum foil to prevent contamination with leavened foods during the eight days of the holiday. (The first time I saw a kitchen done up like this, I literally did not understand what was going on. I thought my friend’s mom might be off her rocker. I was gently instructed.) Anything made with flour, or that could possibly have an atom of leavening or grain in it, has to be eliminated from the home before the holiday. It gets pretty complicated. A candle, a wooden spoon, a feather and a paper bag are involved. I was not raised in Jewish traditions, and the family I married into doesn’t go the whole nine yards on the Passover prep, so I merely marvel at all this ritual and rigor. But I’m no slacker. The descendant of hard-scrubbing Danes, I came home to the smell of Johnson’s floor wax on a weekly basis; I can go all in on a holiday where God himself is telling you to clean your house. I love a sacred mandate to vacuum up a storm, get the windows squeegeed, and eat the last of the Girl Scout Cookies. But Passover is not just about sweeping away the crumbs. It’s about eating a lot, and the foods you eat a lot of are all special to the holiday in that they do not have any leavening or grain. Jewish cooks have figured out many work-arounds for making foods that typically contain flour, by using matzah instead. (It’s not entirely logical—matzah itself is made of flour—let’s not go there. OK: go there.) These recipes become special for the simple reason that they are eaten only once a year, at a (mostly) fun time of singing and story telling. They usually involve eggs. Lots and lots of eggs, to lighten up foods without leavening. These are the guides that light my way. But the deepest roots of my Passover menu are the April 1992 issue of Gourmet Magazine, which has an epic Passover menu in it. About ten years in, I worried that I was going to wear out the magazine, so I made a photocopy. Which I’ve now worn out. I don’t follow the menu exactly. April 1992 me, blushing bride that I was, might have been up for stitching a stuffing into a brisket with a needle and string, but jaded, expedient 2016 me is not having it. Instead, I serve the spinach-farfel stuffing in a baking dish so that my vegetarians can partake. (Farfel is–you guessed it–matzah-in-disguise, crunchy little matzah noodles.) I zoom ahead to an April 1998 Gourmet recipe to get a better braising liquid for the brisket (secret ingredient: all the leftover red wine saved in the fridge door + 12 cloves of garlic). I still make the 24-hour chicken soup, but in the slow cooker, and with matzah balls from a boxed mix. (It has the same ingredients as scratch matzah balls but for some reason they turn out better from the box: it’s supernatural.) I take a page from natural dyeing and throw in a few onion skins to make the broth nice and brown. The pièce de résistance is Simone Beck’s Chocolate Cake. 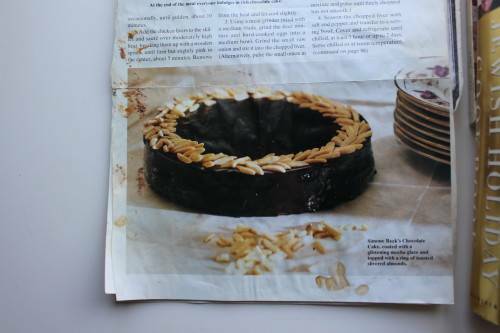 Simone was not Jewish, but her famous cake calls for only a quarter cup of flour. Somebody figured out that you can sub a quarter cup of matzah cake meal (ding ding ding! another matzah disguise) for the flour. We can’t have this every year, but this year we have no one with a nut allergy at the table. We’re consoling ourselves for away-at-college Maggie’s absence by eating Simca’s cake, which is mostly ground-up almonds and dark chocolate, and has coffee in the glaze. Oh–what is a balabusta? Watch the movie. 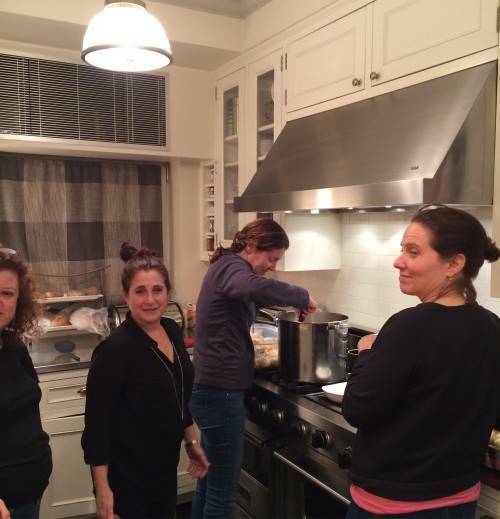 Or look at these gals, who get together every year to make ten pounds of ground up carp and whitefish into gefilte fish. They are all balabustas. (Two of them are even knitters.) Hashtag #squadgoals. Happy Passover to all who observe, and a joyous spring (or fall) to everyone else. I, too make Mrs. Feinbergs vegetable kugel! And Arthur Schwartz has a great apple cake for Passover. My father used to say all this cleaning is really spring cleaning. All I know is I’m exhausted and I haven’t knit or sewn in days! My pot of chicken soup is huge and shared with friends who love knaidlach. Still have to make a matzo kugel. Such a rich and heartfelt post! Especially enjoyable was the film on the definition of balabusta. I, too, did not understand the first time I saw a kitchen covered with aluminum foil. I was a home care therapist working in Rockland County. One of the ladies I was treating had her home health aide assist her in this process. I subsequently was educated in same. 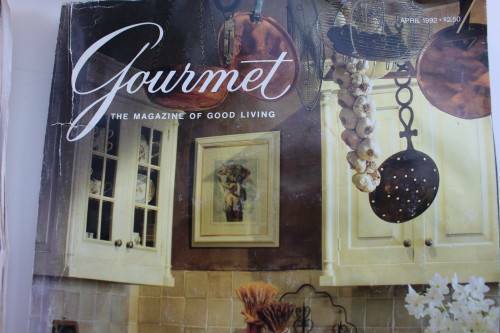 Almost as exciting for me as the picture of Olive, was seeing the Gourmet Magazine. My mom liked that publication. I took it for granted growing up, never thinking that someday it would be no more. Kay, perhaps you would be able to scan your cherished Passover recipes (or type them) and send them in an email to yourself to keep. This way, they will not be lost (especially the dark chocolate ground almond cake with coffee icing–yum!). Wishing all who observe a Happy Passover! I was intrigued by the cake recipe but also confused – how can you add 11 Tbs of sugar from an ingredient list that only calls for 1/4 cup. Is this a typo? Happy Passover and enjoy that cake! I checked other versions of this recipe online, and it looks like it should be 3/4 cup sugar in the ingredient list. Happy Pesach, Kay! 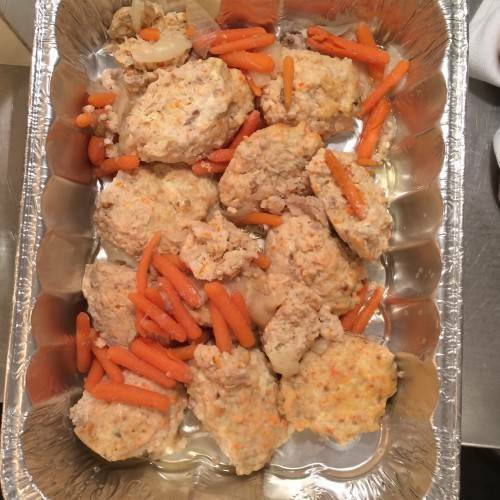 I miss my bubbie’s homemade gefilte fish at times like these. Now, off to check out that delicious-sounding chocolate cake! What a wonderful post! This Iowa Dane loves challah. Happy Passover! Thanks! You’ve inspired me for next year. Wishing you a peaceful, stimulating holiday. The chicken recipe was my mom’s standard for many occasions, as it reheats well, good for when the company is late, or you don’t know exactly when they arriving. We called it “sticky chicken”. I always thought of it as one of those recipes that got passed around, like a simple hat pattern. 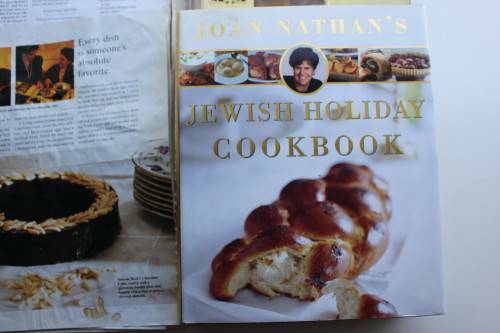 Nice to see that Joan Nathan likes it, too! Thank you for this post and recipe links. I need to try that chicken! Catholic here but my mother’s best friend was Jewish and we got a glimpse of some of the sacred celebrations. Miss her too! Wish you and your a joyous Passover. I am thrilled & honored to be called a Balabusta by such a Balabusta. I will miss your Seder this year but will try to stop by for the Goat Song contest (I’ll let you explain that one) and to try that cake. Happy Pesach to you, Kay! Also I’m bookmarking the apricot chicken. My Nebraska ancestors and my Yiddish ancestors (not the same group of people) salute you. Cannot hang with Gefilte fish. Bring on the everything matzoh, though. I was raised a Texan protestant and did not know what a bagel was until my mom married my stepdad. He prepped me beautifully for all the Jews that would eventually count themselves as dearest of family and friends. Now, can I please have some of that cake? Happy Passover!! Once again an outstanding post. Thank you! Happy Passover! I was in charge once of bringing an appropriate dessert to a Passover seder. It necessitated the purchase of a springform pan! A delicious chocolate cake from Martha with a chocolate espresso sauce over the top, yum. And lots and lots of egg whites. And don’t forget the wine! Maybe next year Chametz Patrol? 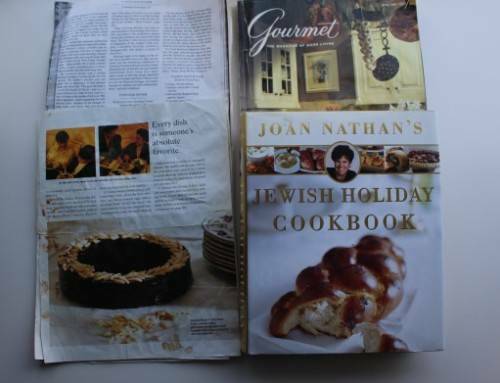 I’ve been making that same Joan Nathan kugel since I married a nice Jewish boy back in the 80’s. It’s a great recipie, but since we all like the crunchy bits best, I started cooking it in muffin tins instead. Crunchy on the edges, dense and moist inside. Yum! Some spring many years ago, probably in the ’90s, Bon Appétit (I think – unless it was Gourmet?) ran a big glamorous spread on a Sephardic menu for Passover. Does this jog anyone’s memory? I would recommend this to you all, but can’t find the issue on my shelves to give further details. Well worth a search on the BA website, though! I’m bringing haroset for 45 (17 of those under the age of 8) to a seder tomorrow. Any suggestions? My sister and I just made Joan Nathan cookies that made it to the our top ten favorite cookie recipe list — my mother is taking them to her Christmas cookie exchange party next year, they were so good. I made them because they are gluten free, and I think the recipe was published in the NYT that way, but what a perfect Seder cookie!! Almond Lemon Macaroons (Almendrados). I did double the lemon. Thanks Kay! Rest info! But I must admit I shocked, yes shocked that you use a matzah ball mix!? And it works???? That’s the truly shocking. I have a great recipe for matzah ball from an old package of matza meal — it’s a different recipe now. So I can show you matzah balls & you can help me choose colors for another Color Affection & a Breathing Space sweater. Next year with color-filled handknits! Btw, 24 hour soup? Why? What? How?! I forgot to mention Apricot Chicken in my comment above, which was a staple of my childhood. Instead of a fresh onion, my mother’s recipe called for a bag of Lipton’s Onion Soup sprinkled on top. It must wreck the recipe for a Seder, but it tastes great. My Mom is still a great proponent of the Lipton’s Onion Soup mix–the universal seasoning! Zissen pesach to you all. Enjoy the cake. I think my mom may have made that when I was a kid too. I’ll have to check. Wonderful post! Enjoyed it so much. Thank God I haven’t thrown out any of my Gourmet mags. We always make almond cake with fruit and whipped cream. Adding chocolate sauce might be just the thing! Happy Passover! Reminds me of Christmas and the potential for a happy mix of stress from so much prep, special food and then extended visits with family and friends. Of course the alumimum foil process is different: make starts or some such and get it on the tree. I am the descendent of Danes, but why oh why didn’t I get the hard-scrubbing gene? My floors are lucky in they get vacuumed, let alone washed. I do, however, love fish. All kinds of it, even the stuff that grosses most people out like sardines and herring. So I did get one good gene from my ancestors! 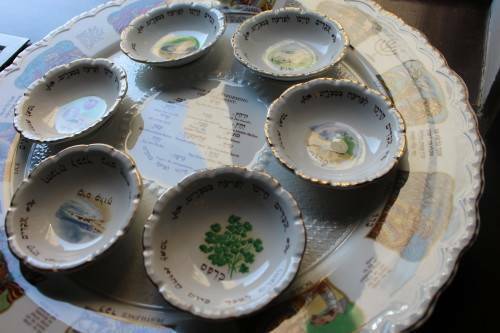 Wow, that Seder plate is the same as ours. I married in too. Chicken soup is on the hob now. I love traditions!!! We are gearing up for Orthodox Easter next weekend. Olive, as always, looks stunning. 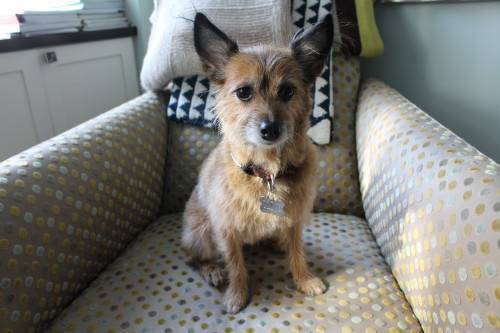 I am not going to let my Yorkie see her picture, or she will wonder why I did not coordinate my living room furniture to match her. Let’s hear it for convenience!!! The Apricot chicken recipe will be very popular at my house. Happy Passover and happy spring to everyone. Mrs. Feinberg’s vegetable was a big hit tonight as was the brisket. We usually prepare a vegetarian main course but I could not resist the brisket this year. Our house smells like home- and the chicken soup tastes just like to soup my grandmother made. Happy Pesach to all. Wishing you and yours a Zizzeh Pesach. does Olive eat matzoh crumbs? Happy Passover to you too. I’ve had to add a few gluten free passover recipes for my daughter. These new traditions make for wonderful holiday memories. Does that mean I not qualified as a knitter yet? I guess I have to be consoled with the Balabusta title.